Because of this the Church places great importance in the preparation for the Sacrament of Baptism. At the Parish of the Immaculate Conception parents wishing to have their child baptised should contact Fr. John in the first instance by e-mail at admin@immaculate-conception.org.uk They will be asked to fill in the Baptism Application Form available from the parish office or website. They will then be required to publically ask for the Sacrament of Baptism during one of the Sunday Masses and to attend a compulsory Baptism preparation course on a weekday evening. There is a charge, detailed on the application form, to cover the cost of administration and the baptismal candle. It is requested that at least one of the names given to the child be that or a recognised Christian Saint. It is customary, although not obligatory, to give an offering to the minister performing the Baptism. Please download complete the Baptism application form and send to the parish office. St. Paul, writing to the Romans (5: 12, 19) states that sin entered the world through one man, Adam, and because of this death has spread through the whole world because everyone has sinned. But just as death entered the world through one man, Adam, so all men were returned to life through and in one man, the Lord Jesus Christ. The Church teaches (Catechism 396 to 412) that all, with the exception of the Blessed Virgin Mary, are born in a state of original sin, which only the sacrament of Baptism can remove. Through Baptism all die in the Lord Jesus Christ and are raised to new life in him. Through Baptism the spiritual body of the Lord Jesus Christ, the Church, is built up through the addition of new members. Through Baptism the faithful participate in the priestly, prophetic and kingly mission of the Lord Jesus Christ. Because of this the Church places great importance in the preparation for the Sacrament of Baptism. At the Parish of the Immaculate Conception parents wishing to have their child baptised should contact Fr. John in the first instance by e-mail at They will be asked to fill in the Baptism Application Form available from the parish office or website. They will then be required to publically ask for the Sacrament of Baptism during one of the Sunday Masses and to attend a compulsory Baptism preparation course on a weekday evening. There is a charge, detailed on the application form, to cover the cost of administration and the baptismal candle. 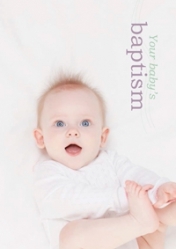 Your Baby's Baptism - a useful guide to all aspects of a Catholic Baptism - available from the Parish Office.